Have you had any snow yet? I suppose not but everyone has mentioned how cold it has been, I was just wondering. We are having rainy weather here but one nice thing, we don’t have to wade around in the mud. Most of my time is spent below decks so the rain doesn’t bother much. Frances spoke about you shocking corn. How much did you cut? Did you sow any wheat this fall? Have the leaves started to fall yet? They are dropping here but they haven’t colored much yet. On my trip to Washington I noticed a number of pretty red trees, something like sumac but larger. This should be pretty country when the leaves do start to turn. People talk about the wasteland in Kansas but there is five acres of marsh and wasteland back here for every one at home. The corn doesn’t look as good as ours either. The corn shocks don’t look big enough to stand but I guess they do. The rivers are larger than the Neosho but they aren’t all timbered. Lots of the hills are covered with trees. 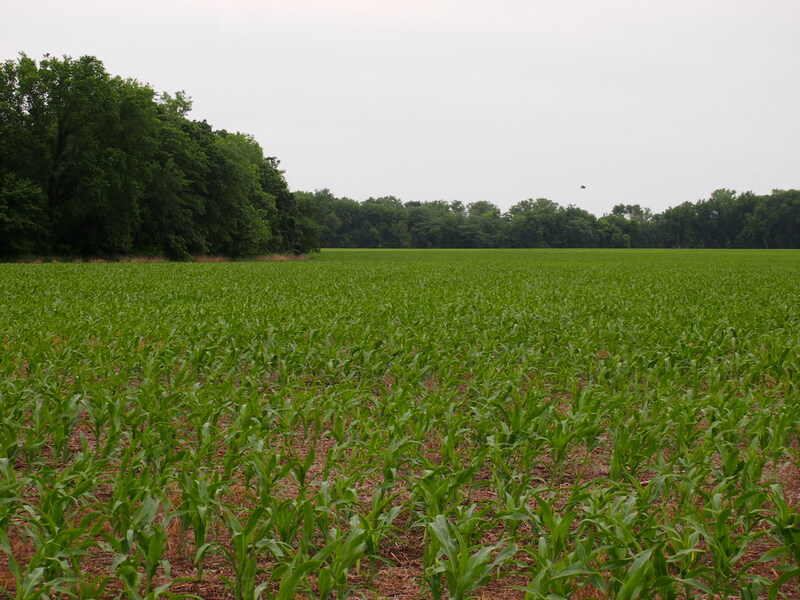 Corn crop in early summer on the Kansas farm of Lester’s childhood. I saw a show the other night that I wish you folks could have seen too. It was a marionette show and it was really good. One of the marionettes played a toy piano and even turned the pages of music. One couple did a dance together and lots of other numbers that I can’t remember. Near the end of the performance the top curtains were drawn so we could watch the three men and a woman who manipulated the strings on the marionettes. They really have to have nimble fingers. We aren’t allowed to write, keep or possess diaries anymore in the navy. I just thought I would mention it as some one might be planning to send them to some of the boys. I don’t know if that affects the army boys or not. I bought myself a belt knife when I was in town Saturday. I looked all over town before finally finding one like I wanted and had to talk the salesman into taking it out of his show case. I was in the machine shop Sunday, sharpening it when a couple of the officers came in and saw me so they had to sharpen theirs too. They are really a swell bunch of men. Today while some of us were in the shop a call came over the speaker for Lieut. McKinsey to please report to the quarter-deck. Without looking up, I remarked to the other fellows, “now that’s funny, they never say please to me, it just, ‘Harris, report to the quarter-deck, on the double’”. When I looked up, there was an officer, smiling at me. Boy, I was sure glad he was smiling. It is time for lights out and I’m sleepy so guess I better sign off. 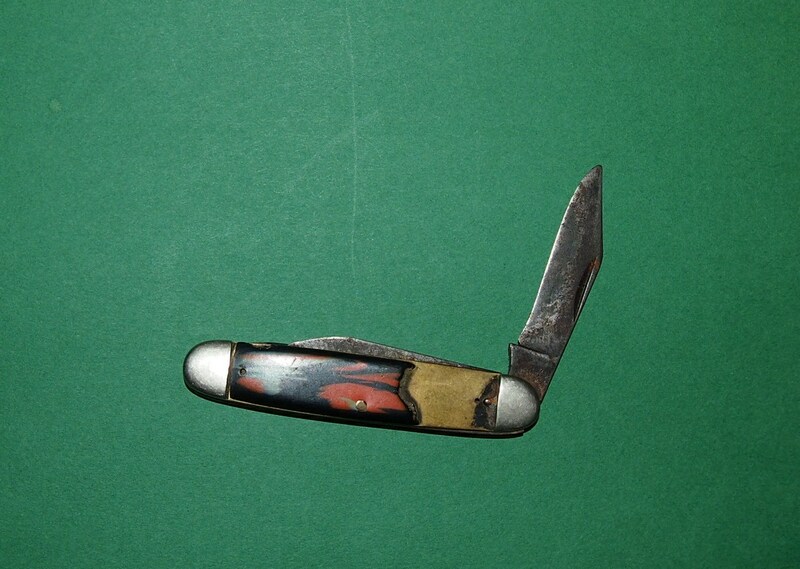 A knife Lester carried in 1942.